The Army is the largest of our Nation's military services and has the greatest need for recruits. So, You Want to Become a Soldier? Of all the services, the Army offers the most enlistment incentives, including the highest enlistment bonuses, more education funds (to supplement the G.I. Bill), various enlistment options, and is the only service which includes guaranteed job-training in every single enlistment contract. Additionally, the Army has the reputation of being the most lenient service when it comes to approving waivers for medical/criminal disqualification factors. Now, that doesn't mean if you fail to meet the DOD's standards for enlistment, that the Army will let you in. Each waiver request is individually evaluated, based on its own individual merits. However, your chances of receiving favorable waiver consideration from the Army is probably significantly better than any of the other branches. So, how do you become one of the new Soldiers who will enlist in the Army this year? Your first step in the enlistment process is to meet with a recruiter. Army recruiting offices are located in all major U.S. cities. You can find them listed in the telephone book in the white pages, under "U.S. Government." You can also locate your nearest recruiter using the Recruiter Locator on the Army Recruiting Web site. The recruiter will conduct a "pre-screening" to see if you are qualified for enlistment. The recruiter will ask you about your education level, your criminal history, your age, your marital/dependency status, and your medical history. The recruiter will weigh you to ensure you meet Army accession weight standards. The recruiter will have you take a "mini-ASVAB" on a computer, which gives a pretty good idea of how you will score on the actual test. The medical pre-screen is sent to MEPS (Military Entrance Processing Station), where it is reviewed by a doctor. The recruiter forwards the rest of the information to his/her bosses at the Recruiting Company. The review process will take a few days. If there are no obvious disqualifying factors, the recruiter arranges an appointment for you to go to MEPS. If there are disqualifying factors, the recruiter will speak with you about the possibility of waivers. The Army has more than 200 enlisted jobs to choose from. 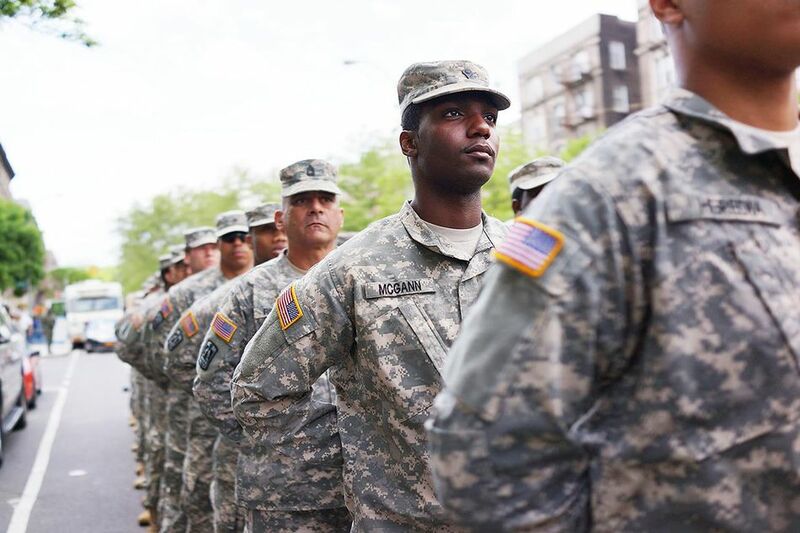 The Army is unique among all of the active duty services, in that every single enlistment contract includes a guarantee for training in a specific MOS (job). The other services have "guaranteed jobs," as well, but also enlist many recruits into "guaranteed fields," in which they won't find out their specific job until basic training. The Army is also the only active duty service in which an applicant can "pre-reserve" a job/enlistment program, right in the recruiter's office, prior to going to the Military Entrance Processing Station (MEPS). Army recruiters (including Army Reserves and Army National Guard) have access to a system called FSR2 or "Future Soldier Remote Reservations System." Any applicant that is a high school senior in good standing or a graduate of high school may pick their job off of the "Request" system from the recruiting station, as long as they "pre-qualify" for enlistment. They then have seven days to go to MEPS, take the physical and then do the final signing for that job. The system also provides a shipping date for the job; enlistment bonus/college fund amounts authorized for that job, etc. Of course, the job isn't "guaranteed" at this point. The applicant has to meet the qualifications for the job (ASVAB, physical profile, security clearance requirements, ect. ), which will be determined during the MEPS trip. MEPS stands for Military Entrance Processing Station and is where your real qualifications for joining the Army are determined. MEPS is not owned by the Army. It's not owned by any of the branches. MEPS is a "joint-operation," and is staffed by members of all the branches. There are 65 MEPS, located across the U.S. Usually, the MEPS process takes two days. Depending on how far the nearest MEPS is from where you live, you may have to stay overnight in a contract hotel. Unless you already have a valid Armed Forces Vocational Aptitude Battery (ASVAB) score, you'll usually take the ASVAB on the afternoon you arrive. The next day, the real fun begins -- and it's a long, long day. Your day will start at about 5:30 AM, and you won't finish until about 5:00 or 5:30 that evening. Your day will include a urinalysis (drug test), medical exam, eye test, hearing test, weight check, body-fat measurement (if you exceed the weight on the published weight charts), security clearance interview, meeting with a job counselor, reviewing enlistment options and possible enlistment incentives, taking the enlistment oath, and signing the Delayed Enlistment Program (DEP) contract. Oh, yeah, intermixed in between all of this you'll fill out lots of forms and do lots and lots of waiting. The Armed Forces Vocational Aptitude Battery, more commonly referred to as the ASVAB is used by the Army primarily for two purposes: (1) to determine if you have the mental capability to be successful through basic training and other Army training programs, and (2) to determine your aptitude for learning various Army jobs. The ASVAB consists of nine subtests: General Science, Arithmetic Reasoning, Word Knowledge, Paragraph Comprehension, Mathematics Knowledge, Electronic Information, Auto & Shop, Mechanical Comprehension, and Assembling Objects. The ASVAB comes in two flavors: The pencil and paper version, and the computerized version. If you're taking the test as part of your enlistment process into the Army, you'll most likely take the computerized version during your trip to MEPS. The Armed Forces Qualification Test (AFQT), often mistakenly called the "overall score," is comprised from only four of the subtests (Arithmetic Reasoning, Word Knowledge, Paragraph Comprehension, and Math Knowledge). The other subtests are used to determine job qualifications. If the MOS (job) you reserved requires learning a foreign language, you'll also take the Defense Language Aptitude Battery (DLAB). Medical Standards for enlistment are set by the Department of Defense, not the Army. The doctors at MEPS will medically disqualify you if you fail to meet any of the standards. There are two types of disqualification: temporary and permanent. A temporary disqualification means you can't join right now, but may be able to, at a later time. For example, if you just had an operation the week before. A permanent disqualification means that you failed to meet the published standards, and that won't change with time. If you're permanently disqualified, the Army can choose to waive the medical disqualification. The commanding officer of the recruiting company will determine whether or not a waiver will be submitted. If the commander approves it, the request goes all the way up, winding its way through the command chain, to the top doctor in the Army Recruiting Command (HQ USAREC Command Surgeon). The CS's office has final approval authority. This process can take several weeks (sometimes months). Many Army enlisted jobs and assignments require a security clearance. To obtain a security clearance, one must be a U.S. Citizen. You can still enlist without U.S. Citizenship, but your job choices and assignments will be limited to those which do not require a clearance. Of course, nobody can tell for 100 percent certain whether or not a security clearance will be approved, and the process can take several months. It is where the Security Interviewer comes in. He/she will ask you a whole bunch of questions about your past (drug use, alcohol use, mental health treatment, finances, criminal history, etc. ), and is pretty good at making a prediction as to whether or not you're a good candidate for security clearance approval. It, in turn, will affect which Army enlisted jobs you are eligible for. You're almost done! All you have left to do is to go over your contract and enlistment options and take the Oath of Enlistment to enlist in the Delayed Enlistment Program (DEP). A counselor will go over your contract with you line-by-line. The counselor will also go over the various enlistment options, and any enlistment incentives you may qualify for, based on the MOS (job) you choose, and your qualifications. If you failed to qualify for an MOS that you may have pre-selected in the recruiter's office, the counselor will discuss alternative job possibilities. The waiting period in the Delayed Enlistment Program is probably the hardest thing about the enlistment process. The Army recruits for several months in advance. Depending on job and training availability, you may have to wait for several months to ship out to basic training, or your waiting time could be as little as a week. While waiting in the DEP, you'll meet with your recruiter periodically. How often is up to the recruiting station. Most hold weekly DEP meetings, but often only one meeting per month is mandatory. Often the recruiter will arrange for guest speakers, such as recently graduated recruits, or senior recruiting officials. Your recruiter will also use these meetings to help get you ready for basic training and your Army career. In fact, you can even be promoted while in the Army DEP, by accomplishing a DEP "Task List," by learning certain Army subjects, such as Military Time, Drill and Ceremonies, General Orders, Rank Structures, Phonetic Alphabet, First Aid, Land Navigation, and passing the Army Physical Fitness test. The time will finally come when it's time to ship out! You'll return to MEPS to process out of the DEP and onto active duty. The folks at MEPS will have you fill out some forms to ensure that nothing has changed (medical, criminal history, etc.) during your time in the DEP, which could affect your enlistment qualifications. You'll then review and sign your active duty enlistment contract, take the enlistment oath again, then be put on a plane to your basic training location (the Army has several basic training bases). Following Basic Training, you'll proceed to AIT to learn your Army job (or, you may attend OSUT, which is basic training and job training, all rolled up into one course). When you graduate AIT, you'll be granted a week or two of leave (vacation time), and then it's on to your first duty assignment. Good luck with your Army career! Does a Positive Drug Test Disqualify You From Enlistment?